When procuring Halloween candy to give out to the kiddies, I tend to buy a bag or two of stuff they like and a bag of stuff that my husband and I like. This year it was Skittles® for them, and Salted Nut Rolls® for us. Some kids like them, but others gave me a look that said, "that might as well be a carrot". So I've got a lot of leftover nut rolls and I decided to try to make bars with them. 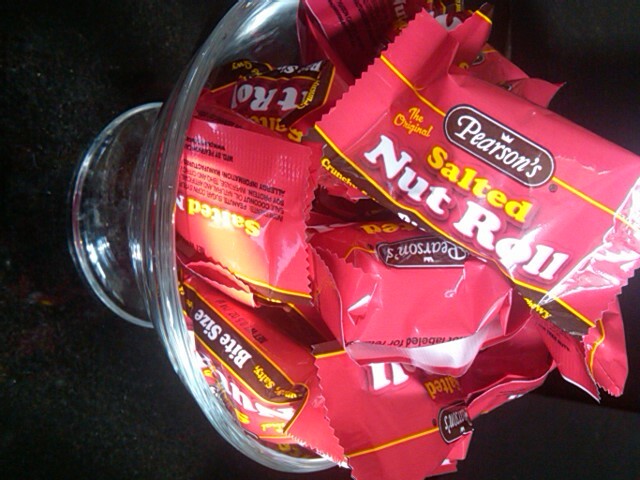 Why do I feel compelled to take an already plenty sweet goodie and add more sugar, fat and carbs to it, I can't say. 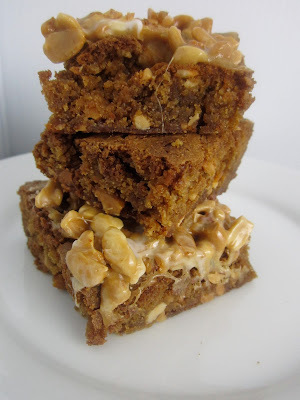 I just really like a chewy bar and am always on the lookout for an excuse to make them. The basic dough is a Blondie recipe adapted from Joy of Cooking. 2. Butter the inside of an 8 x 8 pan. 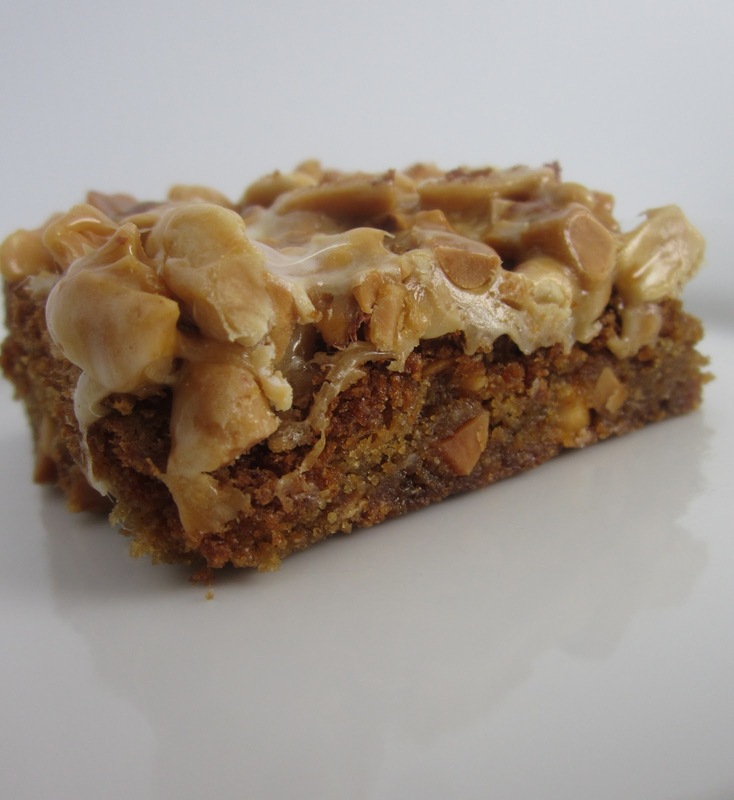 Slice candy bars and set aside. Put flour, baking soda and baking powder into a bowl and whisk to combine. 3. Melt butter in large saucepan until boiling. Boil for 3-4 minutes stirring constantly until brown. Take off heat and stir in brown sugar and honey. Let cool a bit, then add flour mixture and stir until combined. 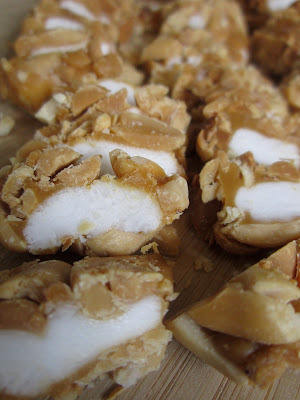 Add candy bars and fold in (they will melt, but the flavor, sticky caramel and crunchy peanuts will be left behind). 4. Pour into prepared pan and bake for 20-25 minutes or until a toothpick comes out clean. Cool completely and cut into squares. Optional Topping: Melt 7-10 candy bars in a bowl in the microwave for 30 seconds, mix vigorously and spread immediately over cooled bars for chewy, crunchy topping that is totally unnecessary but delicious nonetheless.